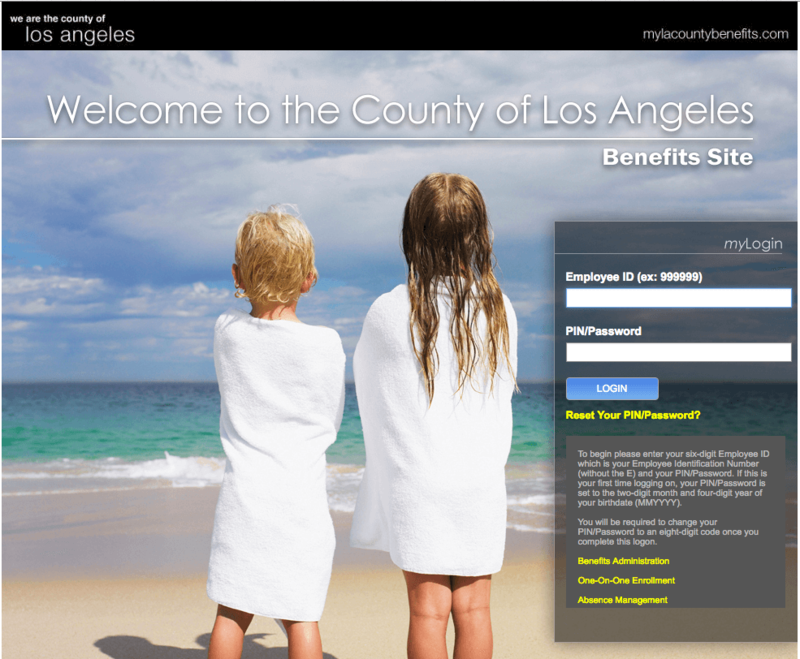 UPDATED: October 1, 2018 – My LA County Benefits is your one-stop shop for a breakdown of information and all things relating to the services and rewards associated with being an employee of the LAC. While there is plenty to explore the website, be sure that you are specific in using Internet Explorer as your browser, as there are areas of the website that are exclusive to IE. Among the many advantages of having an online account, you’ll find access to Absence Management, One-On-One Enrollment, and information on the Benefits Administration. Getting set up with an account login is easy and straightforward on this website. To log into the online portal, you’ll need to have access to your six digit employee ID (which is your employee identification number excluding the “E”) as well as your PIN or password. If it is your very first time logging in, you will enter the two-digit month and four-digit year of your birthdate as your password. Once approved, you will be prompted to change your passcode to a unique eight-digit code, which will be your PIN/Password from then forward. For retired employees of the LAC, you may be wondering how to access information on your benefits. To do that, you must first apply. When the Office of Personnel Management receives your retirement application, it may take up to 3-4 weeks before they are able to review and approve it. This can sometimes take longer if there is a mistake or other discrepancy on your application, which warrants additional information and reviews. After the approval process has been completed, OPM will mail you a welcome letter and a retirement card. The retirement card will contain your CSA (Civil Service Annuity) number, a seven digit number that is included on all correspondences from the Office of Personnel Management. If the retiree has passed away and you are the survivor, applying for their benefits, you will need to send a certificate of death along with the application. Once approved, they will mail you the same welcome letter that instead includes your CSF number, which will be included on all correspondences with them. I have been getting trouble logging in to sing up for medical insurance.